Honda S2000 vs Corvette C6! Not The Outcome You Expect! - Muscle Cars Zone! Honda S2000 vs Corvette C6! Not The Outcome You Expect! Spending certain amount of money on your car in order to make it more appealing and powerful is something common. People spend thousands and thousands of dollars each day, but the money is well worth hence you get the thing you were always looking for. There are two types of people who invest in their cars; the first one being more concerned about the looks of their ride whereas the other one keeping in mind only the speed and power. 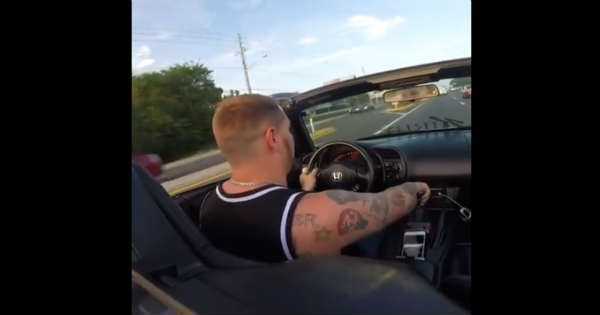 Hereby we check out this video in which a Honda S2000 owner has obviously spent some cash on his car, and we see him taking it out for a street race. He wanted to test it out against none other than this mighty Chevrolet Corvette C6. We all knew that something amazing was about to happen. As the video starts, we see the driver sitting in his Honda hence he mounted a camera at the back. He is obviously warming up for something. Soon after the first street race takes place on an empty road. The two cars are off to a furious start and it seems that the Honda got the win over the powerful Corvette. After a while, they were ready for yet another one, and again as in the first street race, the Honda S2000 claimed victory. Luckily there were no cops around because otherwise, they would have been in big trouble. What do you think, how much money has this Honda owner spent on his car to make it that fast? Finally, if you want more action, then follow this link!